Peace, we all long for it, and it is the premise that when someone can live peaceable among messiness they have truly arrived at a level of greatness. Peace in context is the absence of confusion, the absence of war, keeping peace, and so on, and we note that it is an ideal situation when all is calm and quiet. How does a person come to a level of peace? As I was looking at the definition of it I notice a reference to mental calm and tranquility, but also note the use of “law and order,” and ask do we have law and order and if not how do we get it? The word on the street is that “The Law” of Yahweh is null and void, however, without it we are thrown into a tail spin, so how do we live in peace if we don’t know the law? The answer is we learn it and live it. In the United States there are simple laws and there are more complex laws to govern us. I will use a common law against stealing which is against the Law of Yahweh and also man’s law which says “Do not steal.” In this common law we ask why is it not good to steal? Why can’t I go out and take what I want; especially, if I am hungry or if I need a car why can’t I (a person in need) have what I need? For one thing we note the law of the land which is common and says that if I steal I am going to jail or pay a fine in which I most likely can’t pay because of the fact that people with money are lest likely to steal or I will do what the word of Yahweh says and not steal because he says so. In the latter case stealing is not appealing and I have turned away from thoughts of this which in turn promotes peace for my neighbors and society as a whole. Hence, I see that it is for the common good of mankind that this law exists, because there is peace promoted for everyone. I can hear it, people saying “They steal anyway!” Yes, because they don’t know God and they don’t know Peace. There is no in between, either we know Yah or not. We can’t have it both ways. 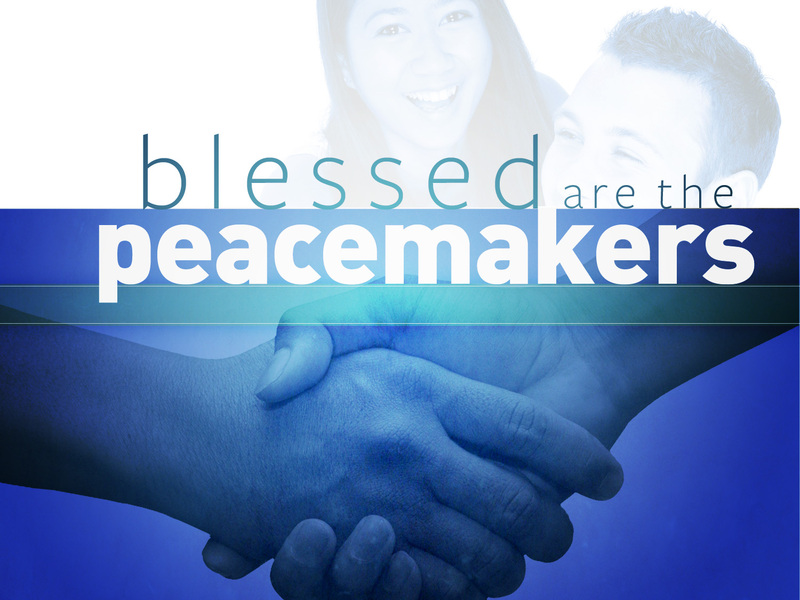 Today: The law of Yahweh promote peace and those who follow them are the Peacemakers. Are you one? Study the law and live it, it is for your good. Posted on January 15, 2013, in Children, Devotion, Encouragement, Family, Home, Life, Marriage, Men, Mental Health, Ministry, Public Safety and Awareness, Religion and Spirituality, spiritual, Video, Women, Work and tagged absence of war, BELIEVERS, Bible, blessed are the peacemakers, Christ, Christian, Education and Enrichment, Elohim, ENCOURAGEMENT, Fruit of the Holy Spirit, GOD, Gospel of Matthew, Holy Spirit, Law, Matthew, Matthew 5:9, Peace, Prayer, Religion and Spirituality, United States, UPLIFT, Women, Yahweh. Bookmark the permalink. 6 Comments. Christians is a way should be peacemakers, because they should be followers of Christ Jesus, Jeshua the Nazarene Jew, who preached “Peace” and brotherly “Love”. this master teacher and prophet paved the way to come closer to his Father, who is Total Love. the Love Jehovah God showed for the world, and the love the prophet Jesus showed we should burn in our heart and spread it out all over the world, so that it may come closer to what it should become in the end when Jesus shall return and restore peace on earth and giving entrance to the Kingdom of God.